Do you think your home's sofa less some Spring color? Kevin Textile New Listing 2018 Spring & Summer Checkered Weaving Linen Pillowcases, 8 the most popular colors for you to choose, 2 sizes to meet your needs of various scenarios. Material: Cotton & linen blend. Washing Guide: Machine wash could separately, gentle cycle only, no bleach, low tempurature iron. Due to saturation levels on different monitors, the color of the actual product may vary slightly. Due to hand made, there might be a 1-2 cm size difference, hope you kindly understand. Kevin Textile is a registered brands, please purchase certified products from Kevin Textile. We are not responsible for any other brand. 2018 New Design: checkered weaving linen pattern. 8 spring fresh colors for your choose. 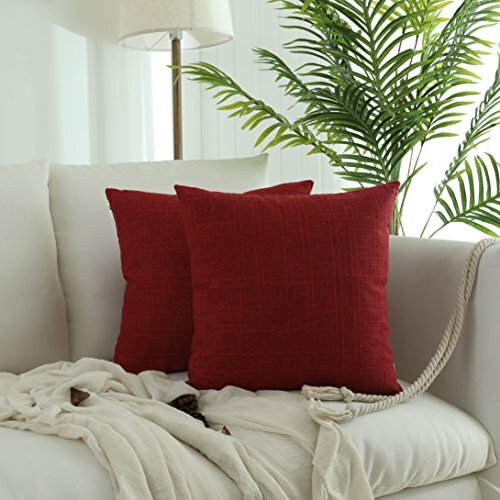 2 pc 18x18 inch (45x45cm) linen throw pillow cover. Package do not contains pillow insert. Material: soft linen blend. Use hidden zipper in the same color as the fabric. Machine wash could separately, gentle cycle only, no bleach, low tempurature iron. KEVIN TEXTILE is a registered brand. Please only purchase from Kevin Textile. We do not guarantee the quality and customer service if your buy from the other sellers. If you have any questions about this product by Kevin Textile, contact us by completing and submitting the form below. If you are looking for a specif part number, please include it with your message.